Hannants have it in "Future Releases" priced at �20.99 which isn't too bad. I just hope the pound doesn't fall any more before they fix the final price! I never buy from Hannants unless they are the only source available due to their high prices. All the Zvezda kits in that range, �20.99, retail for �17.99 at eModels in Stoke which, fortunately for me, is only 30 mins drive away so I can collect in person. Even with postage they are cheaper than Hannants. They even stick 20% onto the price of Two Six decals when the supplier lives within walking distance of their warehouse. I wasn't recommending Hannants, but theirs is the only UK price I could find! I've dealt with eModels many times and found them excellent. That's great about the hot sections! Excellent attention to detail. I'm still scratching my head over the two different aft fuselage/APU exhaust parts. The NG has only ever had one configuration in that area. Wasn't the point about the different APU exhausts explained earlier in the thread, from your own post #66559 onwards? buzz :Wasn't the point about the different APU exhausts explained earlier in the thread, from your own post #66559 onwards? According the Dan Dornseif, who has asked the maintenance folks at Southwest (and if anyone in the world knows about 737s, it's the maintenance folks at Southwest), there has only ever been one APU exhaust cone configuration on the NGs, from the first airplane to the most recent ones. Now available from PAS models for approx. �14/$18. The latter versions of NGs have an air inlet over APU exhaust pipe for cooling the APU and it reduces noise by 12DB that's generated by the APU. Guys please read this because there's No need to ask Southwest mechanics about this and BTW B-737NG's doesn't have double APU. But whey missed comments at bottom of page about incorrect photos of 737-400 in this walkaround. Accordingly, part E4 is marked as "unusable part" in Zvezda model kit instruction. Just do not pay attention to this part. The Zvezda 737-800 landed in Tucson this afternoon. So far, all I have to say is "WOW!!!!!!!" Kudos to Zvezda for nailing many of the small details that have never been seen on any model airliner before. The small, subtle aerodynamic fairings on top of the wing root, separate brake disks for the main wheels, extremely fine engraving throughout, and on a quick dry fit of major parts, virtually a click-fit all the way through. The wings feature the leading and trailing edges molded with the upper halves, allowing for razor thin trailing edges and no seam along the leading edge. The fit there is superb. I'm really jazzed. Very good news indeed! I'm looking to purchased at least 3 for starters and it appears I've built my last Revell of Germany 737-800 should that kit ever be reissued. Thanks, Jennings! I'll be building MANY of these over the coming years. Just started on mine. In addition to what Jennings has already said, I'm particularly impressed with the engine assembly. A dry fit shows that the engines and pylons fit together almost seamlessly. I'll definitely be investing in many more of these. Are there any sink marks on the upper wings? This is a common problem with Zvezda kits. None on my two kits. On my kit, there are very shallow sink marks on both sides of the separate piece rudder, towards the bottom. Easily solved. I have built the Tu-134 and the SSJ-100 (twice) and on all the kits there were noticeable sink marks on the upper wings at the point where the underside changes from being one-piece to recessed for the separate lower surfaces (if you see what I mean). It wasn't the end of the world but getting rid of the sink marks and restoring the scribed detail to match the original was a nuisance I could have done without and I was just wondering if the 738 suffers from the same problem. Erm, yes, I appreciate that. If there were sink marks on the wings of my kit, I would have said so. As you seemed to be concerned about sink marks, I thought you might be interested to know about the (very shallow) ones on the rudder, on my kit at least. Great to see LU make a reappearance. They shall suit the zvezda kit very well. Great, Jennings! I've been planning an AA 737 for quite some time. I'll finally be able to do one with proper decals! Jennings, will you include multiple registrations and names on the KLM sheet or just PH-BXZ? Great to see you planning these decals! It's not important for the actual decals but the KLM engine nacelles should be very light grey just as the belly. They appear to be white in your drawing. I couldn't decide whether the belly was pure white or off white. Is it a warm grey (tending toward brown) or a cool grey (tending toward blue)?? It's got to be a *very* light grey color. Is the vertical tail white or the same light grey?? I'm including all of the -800 registrations and ship names. If Zvezda does a -700 or a -900 maybe I'll do an update to it. I'm pretty sure KLM retained the pale grey belly when the livery changed. The fin is definitely white as it always has been. The contrast between the fin and the lower fuselage is quite noticeable towards the end of the video when the aircraft has passed the camera. Question: is the upper part of the winglets white or light grey? I absolutely cannot tell, but since the light blue KLM logo is on white on the tail, I wonder if the winglets are white as well? Now you ask it, I'm not 100% sure about the KLM winglets. I would've made them white with no hesitation since they put the light blue KLM logo on there just as on the white tail, but I can't give a decisive answer. The KLM winglets are white, they often seem gray because they cant out and thus have less light on them. One thing to note though is that many of them have a medium gray until just past the base, especially on the inboard side. It is a very nice surprise to see that Liveries Unlimited is alive and kicking. 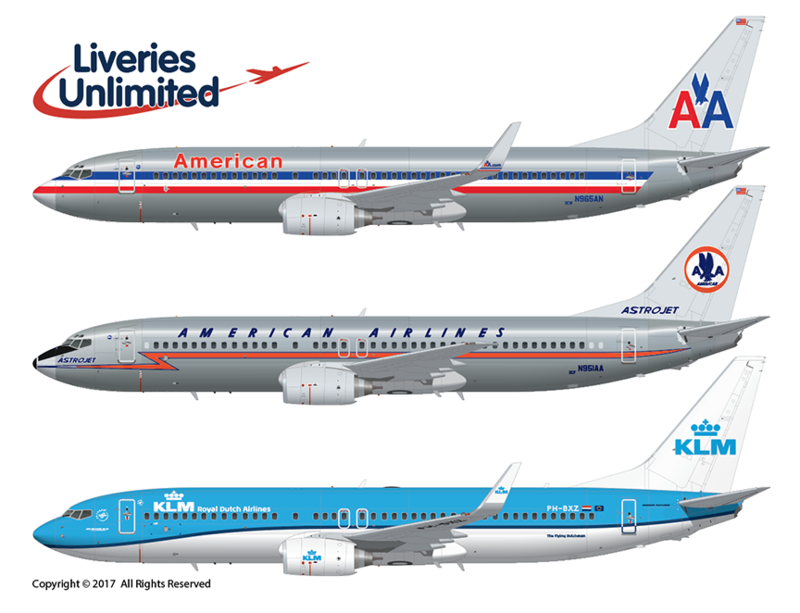 I don't know how far you are with the design of the decals, but will you include names and registrations for the other 737 subvariants as well? Now that Zvezda has made a 787-900 out of the original -800 and an A321 out of the A320 I wouldn't be surprised if they do the same with this kit. I've seen the new livery close up at AMS and can confirm that the lower fuselage and engines are virtually white - a very slight off-white. I posted a picture on the previous thread which showed a B738 in the new livery but fitted with a thrust reverser cowl painted in the previous scheme's grey (probably swapped during maintenance). The difference is noticeable. Tail and winglets are white in both old and new liveries. Great news about LIVERIES UNLIMITED resurrection. We miss your decals a lot. By the way, is in your plans for 737 release SOUTHWEST and new ALASKA? Cheers and long live to LU. Thanks for the kind words everybody. Stay tuned - there's more good stuff coming! +1 for any Liveries Unlimited stuff. The IL-62 releases were great! It's really great to have LU back in the game of bringing us many colorful decals. What about some Chinese B-737NG color schemes? Thanks Ray. Not sure how big the market will be (for our business model) for the Chinese stuff, but I'll give it a look. Any favorites? I certainly wouldn't mind any of the following Chinese subjects : Okay Air, Fuzhou Airlines or China Southern. Maybe some obscure choices but I like'm. Here's a list of B-737NGs I'd like you to consider please. Anyone know where I can lay my hands on a high resolution piece of the flat artwork they used to create the computer applied scheme for the Salmon Thirty Salmon? That's the only way I know of to attempt it. I have a scan of the decal sheet I used to build this one if it is of any use to you. The original was very flimsy so I scanned it and re-printed it on laser paper. I only work from original sources, not other people's work, but thanks. VERY HAPPY that you're back in the decal game. Any chance that your upcoming United 737 decal could also include Continental titles? 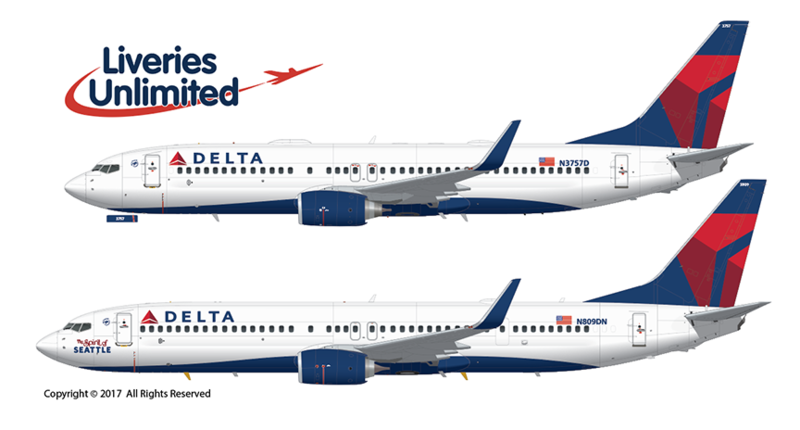 I can't abide that scheme on a "United" bird; the font and case aren't right. It looks perfect as the older, better Continentnal livery, however! I'm definitely getting that KLM and American sheets, as well. Is the Astrojet sheet different from the earlier release from a few years back? As far as Salmon 30 Salmon, the closest I've been able to find is this: http://www.airlinereporter.com/wp-content/uploads/2012/05/salmon_3_salmon800.jpg Airline Reporter states that the image is from Alaska Airlines, so I'd assume it's as close to official as we're likely to get. Checking it against these videos, it looks pretty danged accurate: https://www.youtube.com/watch?v=iWP1AebpwC4 and https://www.youtube.com/watch?v=Hsd8-EESesI&t=46s Doing all of those scales would be a chore, but I hope you try it! PS. Any chance of including a paper template for the Delta underside? Getting it right on both sides of the fuselage is always a chore. Maybe a Xerox printed template that the modeler can then cut out with scissors and tape to the fuselage as a mask? Just an idea;. Thanks for listening. I'm still quite new in the decal printing business but in that salmon I see A LOT of different shades of colours. It would cost me a fortune to get those printed at my silk screen supplier. I might misunderstand something or miss a certain design technique though. Quality costs. It's that simple. Sorry for drifting off the Zvezda 737 topic but yes J, you're right about that. It just surprises me how much money some decal makers are willing to invest to release decal sheets of which creating and getting them printed is just step 1; you still have to sell them to get your money back. I released three silk screened decals over the past few years in very small amounts and those gave me sleepless nights already (it worked out OK though).